Welcome runners, today you will be running 26.2 miles with temperatures ranging from 38-45 degrees, rain with some downpours and 25-25 mph headwinds the entire race. Enjoy your run. 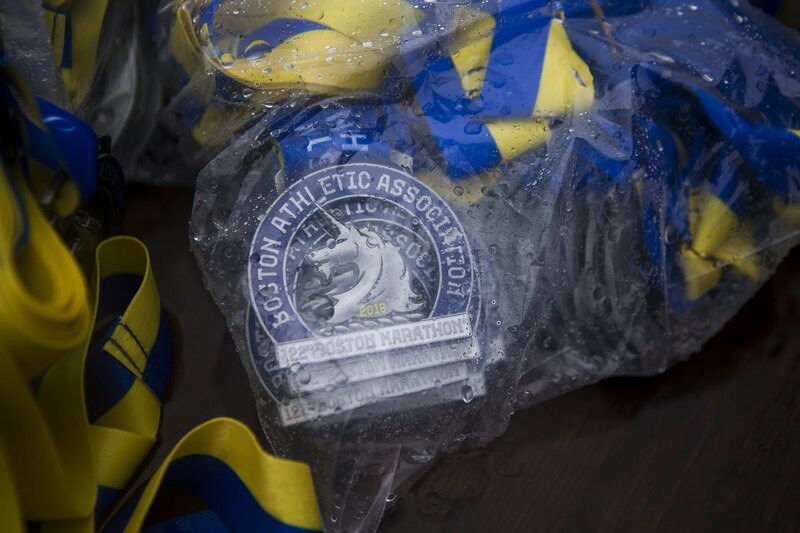 Monday was the worst conditions for the Boston Marathon since 1908. It was so bad that 23 out of the 45 elite runners dropped out. Not my wife, she was a trooper and finished the race. Not the time she wanted, 4 hours and 5 minutes – 21 minutes slower than last year, but considering the conditions, she did a wonderful job. Then consider that it seemed everyone was 20 minutes slower. Last year, the women’s winner finished in 2 hours 19 minutes. This year, 2 hours and 39 minutes. The men’s winner was seven minutes slower than last year and the winner from last year, who finished second this year, was ten minutes slower. Congratulations to Des Linden, the first American winner in 33 years. She was even ready to drop out at one point but she kept on going. For all those that withstood the elements and finished, you are very tough and should be very proud of yourselves. My wife wrote a post on her thoughts on it so I will share those with you now. Last year for Boston I finished 3:44. My training this year for 2018 all shows I COULD do 3:30. That is what I was aiming for. No issues with my back or foot during my training since the start of December 2017. Fast forward to a week before the marathon and one begins to look at the weather app daily just to know what to pack. Didn’t look like it would be too bad for shorts. Think again… Friday before leaving ( left on Saturday) I packed more warm/ dry gear and rain coat and poncho. I prayed and prayed every moment I had that God would change the predictions for the weather…guess He was not having any change of mind. Why??? Let’s just get to it.. race morning… it was raining just sprinkles at first and the wind was not so bad. Get to the Commons to catch the bus to the start and it starts to rain more and the winds gust. My friend and I while on the bus kept saying we can do this we will do it. She is just so awesome! We knew our goals would be shot, we just wanted to cross the finish. Athletic Village was a mud pool. Have never seen so much mud in one place. Still raining and winds blowing. Never seen so many ponchos and umbrellas and garbage bags as coats in one place. Even plastic bags over the shoes. Anything to keep dry. Before the start runners are in the elements. We did have big white tents to stay under and this year they had the sides covered as well. Once you got in you didn’t want to leave. Standing room only. Lucky to find a piece of land to sit on ( if you dare). Before the start I had on 2 pair of running pants, 2 pair of socks, 2 dri-fit fitted running shirts ( long sleeve), 2 pair of gloves with surgical gloves over them ( to stay dry), had a plastic bag over my head with a beanie then a visor ( to keep rain out of my eyes) and 1 running rain/ wind jacket then an OSU rain jacket and poncho. Oh and plastic bags over my shoes as well as duct tape on my shoes. Yes you read right– duct tape. What did I end up shedding? I got rid of the blanket, poncho and plastic bags over the shoes. The duct tape came off during the race. All I wanted to do was finish. I ended up stopping at one point after the half way mark because it was either vomit or use the potty. The hills I made up, I tried to dodge puddles of water on the course but it got to the point there was no way of doing that. My visor stayed on the entire time which surprised me due to the 25-30 mph winds at our faces. The rain at times pounding down on us ( from either side). When the rain would fall harder the crowds got louder. So many wonderful spectators braved the windy, wet, conditions with us. So thankful! Each mile I just thought of those I was running for and the words that stayed in my head of encouragement. I won’t lie, I questioned myself, thought about just stopping but God had other plans for me. Plans to show that through tough, uncomfortable, out of control situations not only was He there but I could do it! Sure I questioned my attire, my hydration, the food I ate prior, my gels all of that ( shows the competitive athlete in me and the heart for the sport) and the stopping to use the potty. My spirits were crushed after the race for sure because I had a plan and goal in mind and it did not happen. I felt as if I failed. I won’t lie I had s good cry at the end and even in the airport waiting my flight home. Then I heard God and read ( truly read) the texts coming in from my loved ones.. I did do it. I battled the toughest weather conditions for the Boston marathon since 1908 ( for the record this was worse), 23 ELITE runners dropped out! I may not of hit my goal but I did it— soaked to the bone I did it. I finished this year in 4:05. That is roughly 20 minutes over my time last year. So with the weather conditions I faced on Monday I will truly take that as a win in my book. I want to thank my family, friends, volunteers and spectators for this year at Boston. My family is a huge supporter in what I love to do and I know Kylie and Rob have to put up with a lot from me during training. None of this would not have been possible without them, without the love and support from family and friends. At first I felt defeated crossing that finish line but as I sit back and take full perspective of the days events God taught me so much more. He wasn’t laughing at me, downing me He was praising me for fighting the course and staying strong! Sorry no pictures but Kathy and I were in another state of mind and taking pictures was the last thing in our minds. I love Boston and I will be back. I have other halves to look forward to this year as well as Columbus full ( where maybe I can get my 3:30 finish) Boston Strong! Kim Strong 2018!